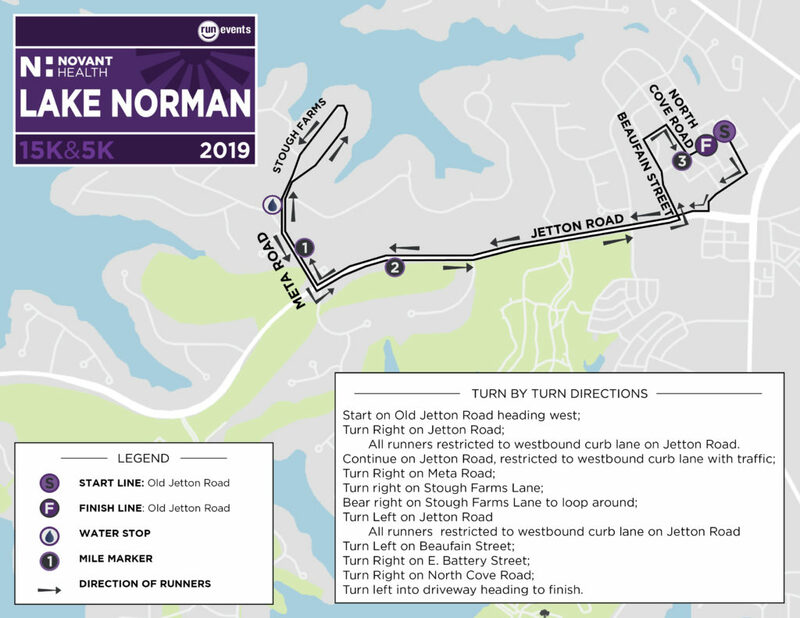 We’re heading north to Cornelius for this multi-distance race along the shores of Lake Norman through Jetton Park! 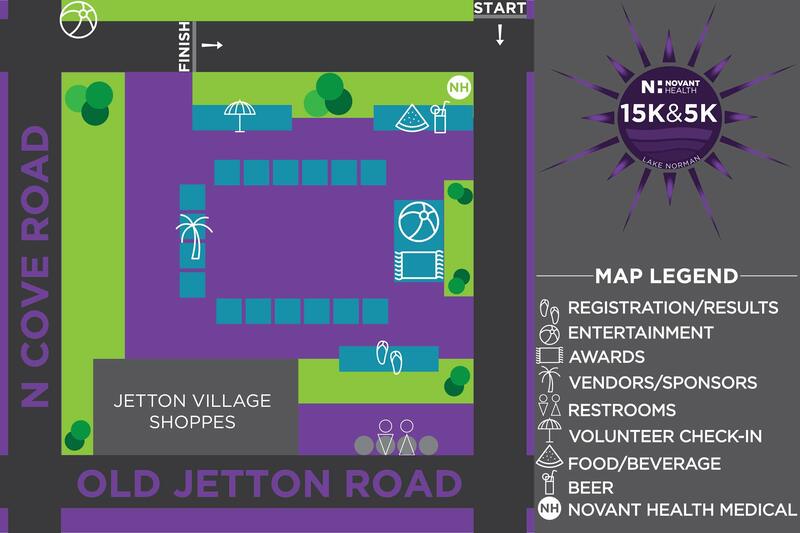 Whether you choose the 15K or the 5K, get ready for a great after party, local, eco-friendly shirts, and a beautiful course! Complete an application and register in person with cash or check at any of the three Run For Your Life locations from now until Friday, September 27. During packet pickup, in-person applications will only be accepted during hours that packet pickup is happening at each respective location. Register online until 11:59 PM, Saturday, September 28. No race day (September 30) registration. Register before 9/14 to guarantee your shirt size. 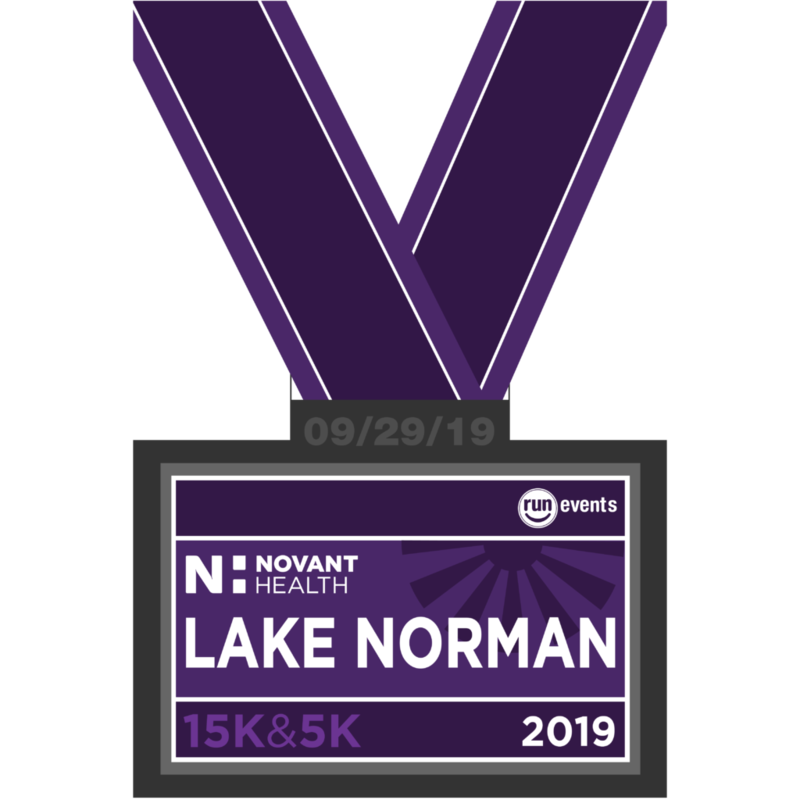 The 15K course is a scenic residential course along Lake Norman’s peninsula. 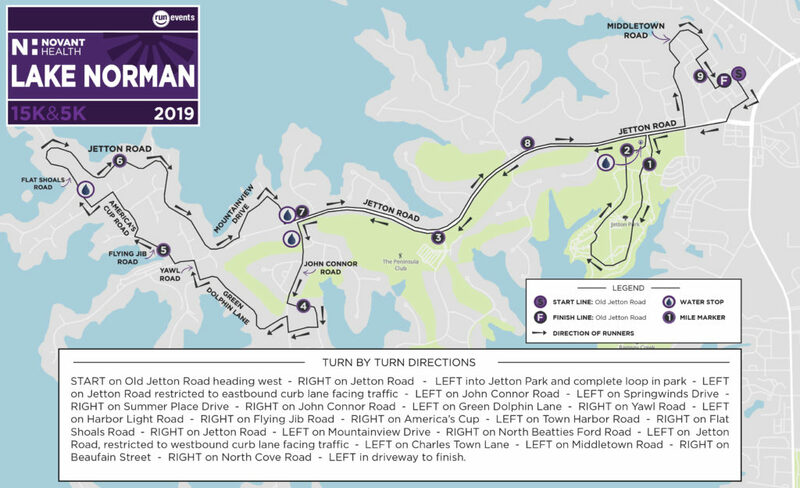 Both the 5K and 15K course dip into Jetton Park and then along the Peninsula Golf Course. Here is the detailed Strava course for the 15K and for the 5K. 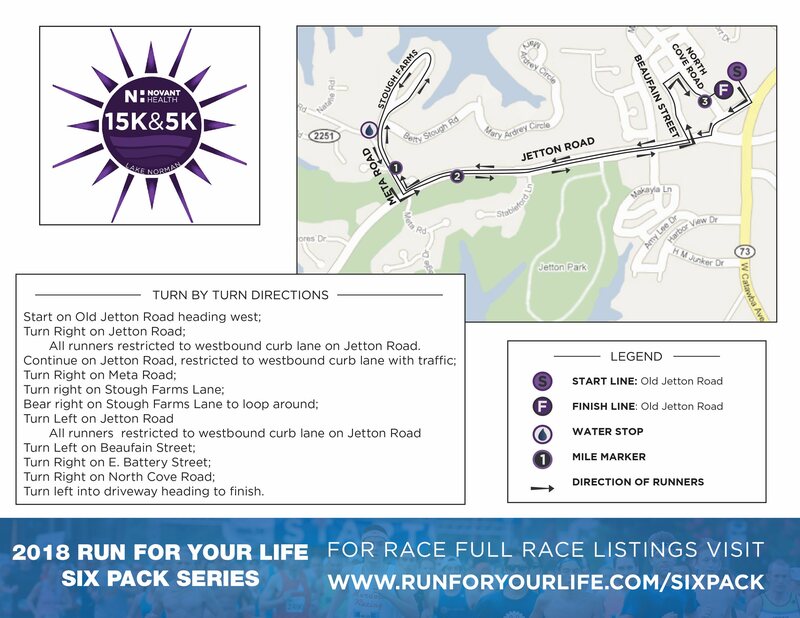 The street address for Jetton Village, the host site for the event is 19818 N. Cove Rd, Cornelius, NC. For directions using Google Maps, click here and type in your starting address. Parking will available at the Jetton Village Shopping Center. Runners are not-permitted to park in front of Harris Teeter, but can park in any other area of the shopping plaza. Awards will be presented at awards ceremony and will not be mailed. Awards will be kept for 2 weeks at the Midtown Run For Your Life location. Age Groups: 7 & under (5K), 8-10 (5K), 11-13 (5K), 14-17 (5K), 17 & Under (15K), 18-20, 21-24, 25-29, 30-34, 35-39, 40-44, 45-49, 50-54, 55-59, 60-64, 65-69, 70 and up. *Clydesdale & Athena: Men weighing 200lbs+ and woman weighing 150lbs+. Category is completely optional and must be checked on application. 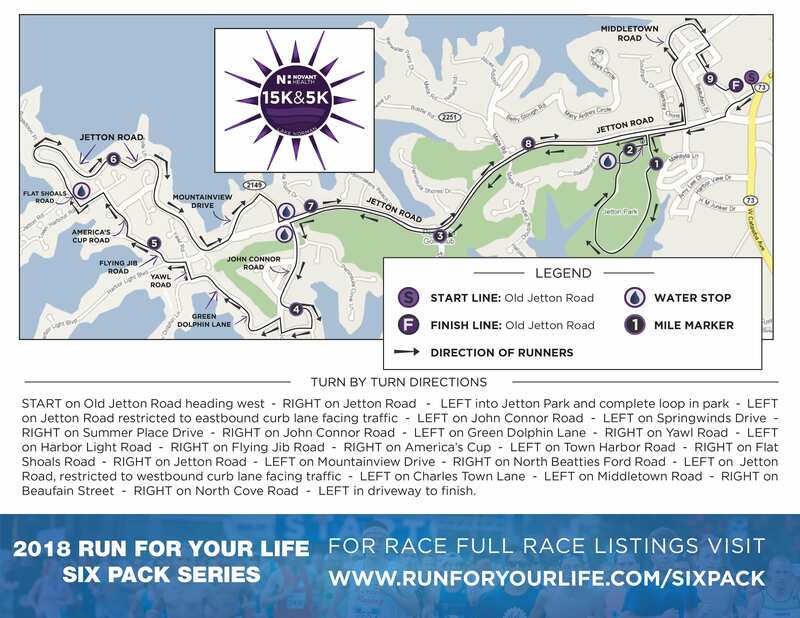 We will also have race day packet pick-up available at the start line beginning at 6:45am. 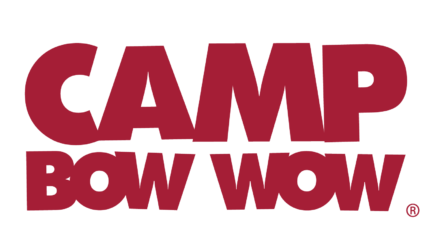 We are excited to partner with RunningWorks for another great event! RunningWorks is a non-profit running program founded to use sport to empower individuals and families to break cycles of abuse, neglect, poverty and homelessness – one stride at a time. Their vision is to stop the destructive cycle of homelessness before it starts by reaching the most vulnerable and socially excluded with values accrued through running – skills they can use to further their lives. Their core values include respect, discipline, teamwork, accountability, honesty, dependability, education, endurance, family, morality, commitment, independence, giving, service, trust, volunteerism, and willingness. Displaying our core values helps break the stigma associated with homelessness. Pet Policy: Sorry, but you’ll have to leave the pets at home for this race. We all love our animal sidekicks, but sometimes they get a little excited and try to tie up other runners. Don’t worry they will be waiting for you at the finish line! You need three S’s when it comes to race day. Selfies. Sweat. and SWAG!! You don’t have to worry one bit when it come’s to the swag department at our races. All participants will receive a finisher’s medal. The medal will be one of six collectors medals. Run all races in the Six Pack series and connect them to make one HUGE medal! The 2019 shirt will be a gender specific Recover shirt! The male shirts run a tiny bit large and the female shirts runs pretty true to size. YOU MUST REGISTER BEFORE SEPTEMBER 14 TO GUARANTEE YOUR GENDER SPECIFIC SHIRT. AFTER SEPTEMBER 14, SHIRTS WILL BE ASSIGNED WHILE SUPPLIES LAST. These are the real heroes of the day! We wouldn’t be able to put on this race or any of our races without these amazing Charlotte companies. Be sure to swing by each of their booths and thank your neighbor for supporting an active city to live in.